We spent a week in Tel Aviv, Israel, only days after we had sent our book to print. The food scene was beyond incredible with lots of options for vegetarians. But as much as we enjoyed eating our way through the city, it was also painful to realize that it was too late to fit some Israeli dishes into the book. So when Design*Sponge recently asked us for a travel recipe that didn’t make it into the book, we were more than happy to share this creamy hummus topped with shakshuka. 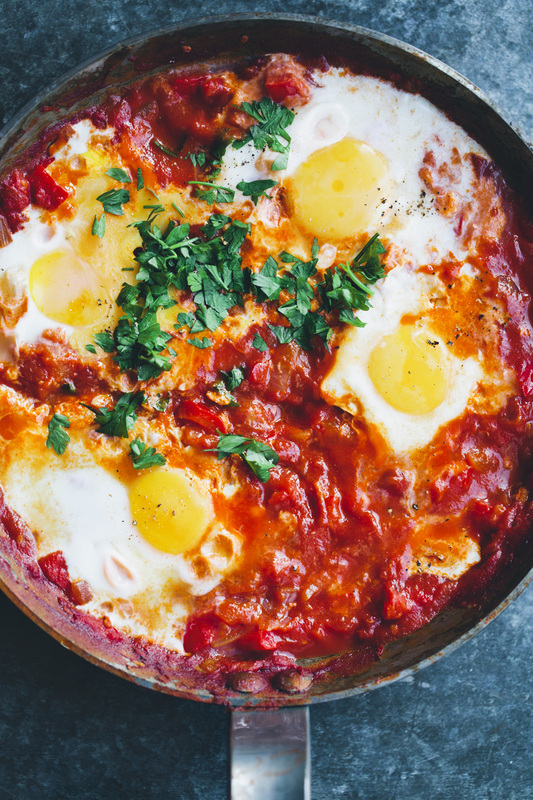 In Israel, they often eat Shakshuka for breakfast but in our home it serves much better as lunch. Or a light dinner. Especially when paired with hummus. We tried hummus with quite a few different toppings (roasted eggplant was another favorite) on our trip, I am not sure if we had Shakshuka paired with hummus but it should be an official combination because they taste aaa-mazing together! 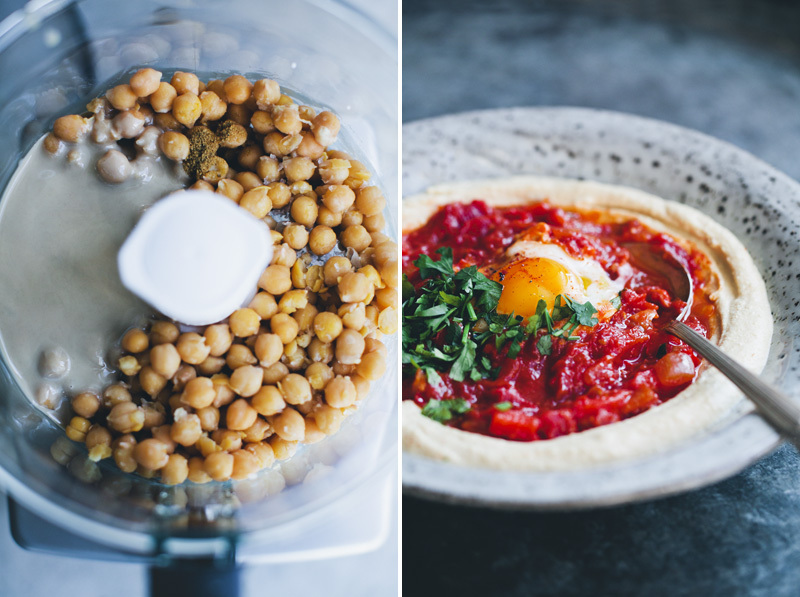 We asked an Israeli chef how he got his hummus so exceptionally creamy and have used his advice to create our own perfect hummus. Most people eat this with a few pita breads on the side, to scoop up all the deliciousness with. Here we are offering a gluten-free option and serve it with home baked sweet potato chips. I know that it’s common among food writers to claim that every recipe they produce is one of their favorites, but this truly is something that we have been eating two times a week for the past month. The combination of a creamy hummus base topped with sweet, flavorful and tangy shakshuka is something that I simply can’t get tired of. Elsa, on the other hand, has started to question my sanity: “Dad. Hummus. Again?!?”. Whether it’s for a single lunch or eight times a month, I just can’t recommended this combination of dishes enough. We originally created these recipe for Design*Sponge! 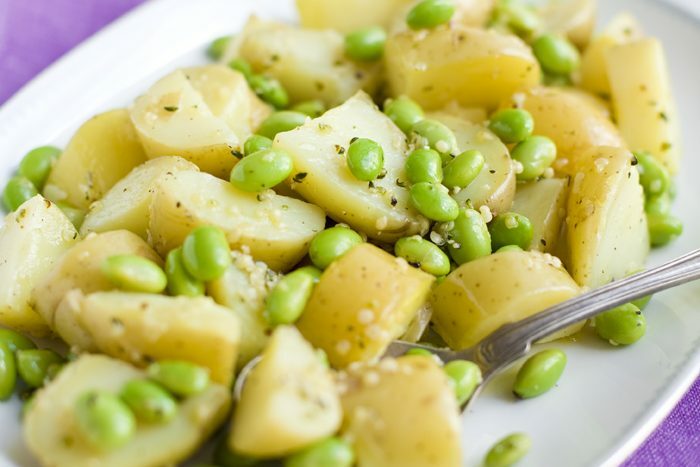 We would definitely recommend trying the full recipe, using dried chickpeas. But if 24 hours soaking feels like a lifetime to you, go ahead and do the quick version. It will still taste a whole lot better and creamier than anything store-bought. And it’s cheaper! Quick version – canned chickpeas: Drain and rinse chickpeas and add to a high-speed food processor together with remaining ingredients and 1/3 cup lukewarm drinking water. Mix for a few minutes, until smooth. Taste and feel the consistency. Add more salt or water if desired, we usually end up using 1/2 cup of water in ours. At this point, you can also add a splash of olive oil for an extra rich hummus, if you prefer. Mix for two more minutes. Cover with cling film if you are not eating it immediately. Full version – dried chickpeas: Place the chickpeas in a bowl with 2 1/2 cups (600 ml) water and stir in the baking soda. Put in the fridge and let soak for approximately 24 hours. Drain and rinse the chickpeas and place in a medium-sized sauce pan with 6 cups (1 1/2 liter) water, garlic cloves and 1 tsp salt. Bring to a boil, then lower the temperature and let simmer for almost 3 hours. Skim off any foam or skin from the chickpeas that rises to the surface. The chickpeas should feel very soft and easily smudge between your fingers when they are done. Drain, but reserve about 1 cup of the cooking water. Add the chickpeas and cooked garlic to a high-speed food processor together with remaining ingredients and 1/3 cup of the cooking water and salt. Mix for a few minutes, until smooth. Taste and feel the consistency. Add more salt or water if desired, we usually end up adding 1/2 cup of water. At this point, you can also add a splash of olive oil for an extra rich hummus, if you prefer. Mix for two more minutes. Cover with cling film if you are not eating it immediately. It is common to add a teaspoon of harissa paste or fresh chili to this dish, but we leave it out since we also serve this to our young daughter. Add olive oil to a medium-sized skillet on low/medium heat. When warm, add onion, garlic and cumin, and harissa if you are using it, and let sauté for two minutes. Add bell pepper and tomato puree and sauté for 5 minutes until softened and then add tomatoes and salt. Use the backside of a fork to mash the tomatoes (careful so they don’t splatter). Cook for approximately 30 minutes. Taste it and add more salt if needed. Make four small divots in the sauce and carefully crack the eggs into them. Cover the skillet with a lid and cook for 5 more minutes, until the egg whites have set (or longer if you prefer). Top with fresh parsley. These chips are quick, easy and good for scooping up lots of hummus or any dipping sauce. Preheat the oven to 400°F (200°C) and cover 2 baking sheets with parchment paper. Cut the sweet potatoes in 1/8 inch / 4 mm thin slices. Place the slices in a bowl, drizzle with oil and salt and toss until they are coated. 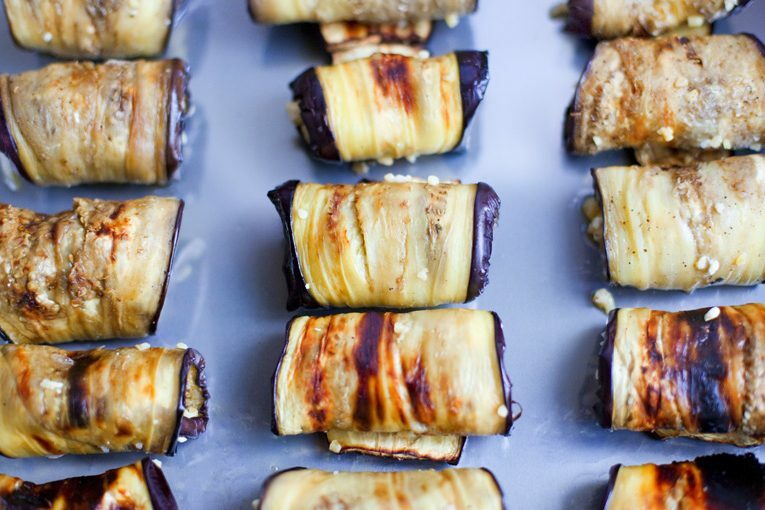 Spread them out on the baking sheets and bake for about 25 minutes or until crispy, flip them half way through. Serve together with hummus and shakshuka. This looks beyond yummy and the pictures are stunning. Thanks so much for sharing. 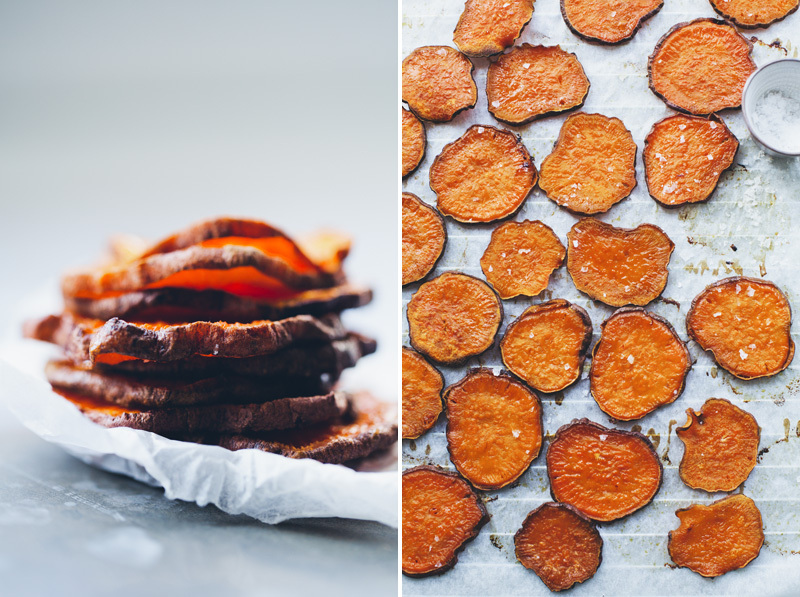 This sounds delicious and I love that you swapped out the pita with sweet potato chips! I had a full dinner planned out to make tonight but one look at this and I have to change our plans! The dish looks both so homey and comforting yet light. A perfect combination. I ceriously can't get enough of Persian cooking at the moment. So delicious! What brand of tahini do you use? The ones I use are usually much thicker than the one in your photo. Or have you thinned it out with liquid? The food looks amazing! Hey guys, that Israel trip was fully deserved! I bet you had a few very busy weeks previously. Israelian food is very tasty by the way, I ate it a lot in Krakau, where they have a whole area with Israelian resto's (the Jewish quarter). Anyway, will your book be on Amazon as well? Loving this giant bowl of colour! Yum! Hej! 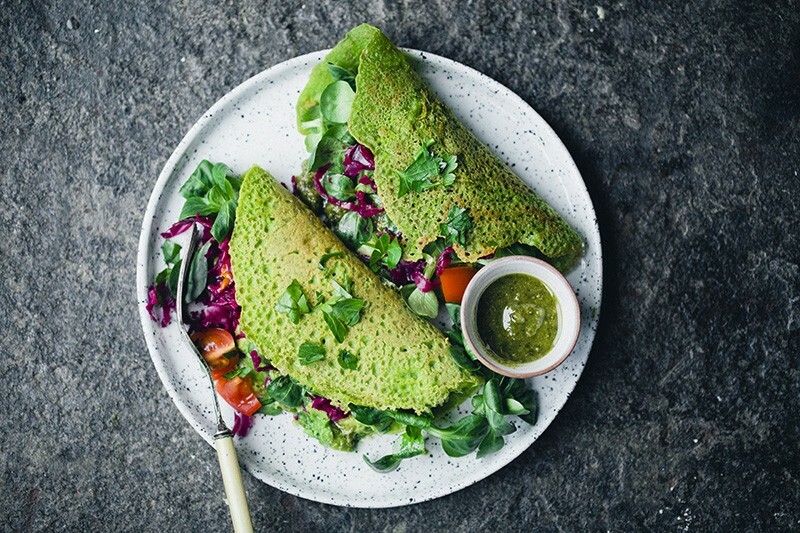 I just discovered your blog and am blown away by the recipes and the amazing photos (which are good enough to eat). I've been a vegetarian for twenty years now and have been looking to move my kitchen skills up a level or two - and your site has so much more than I could have ever hoped for. Thank you so much. Mari. 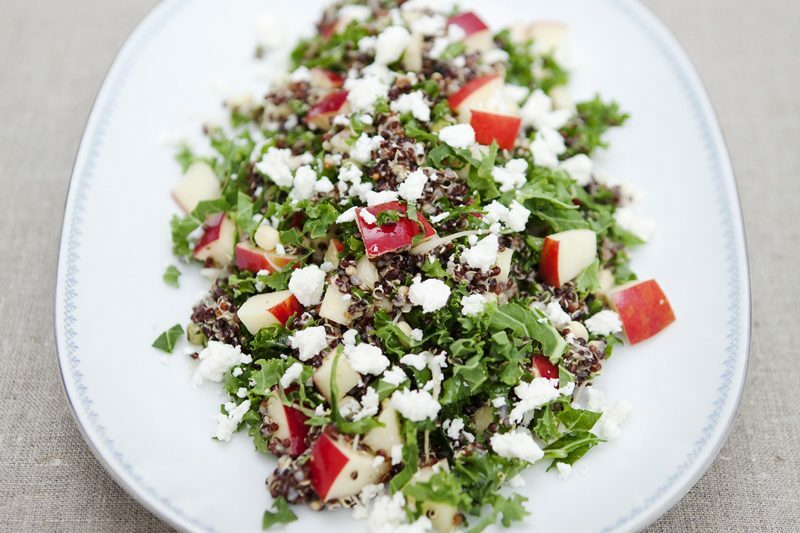 these photos are absolutely stunning-- and two of my favorite foods, combined into one! i never thought of having hummus and shakshuka together on one plate though, that is genius. isn't the food in israel outstanding?!?!?! The photos are fabulous !!! I've never thought of serving shakshuka over hummus. I'm really intrigued by this combo, gonna have to try asap! The food looks abd sounds great. But do you know that neither of these foods are israeli? Perhaps adjust the content then to reflect the fact that shakshuka and hummus are generally Middle Eastern cuisine rather than Israeli. That would be the most diplomatic thing to do I guess? Middle Eastern food is VERY political, you can't get away from it I'm afraid. Just a heads up for any other "Israeli food" posts. I've been making my own version of this ever since I saw the pic on your instagram. Glad to finally see the "official" gkstories recipe. 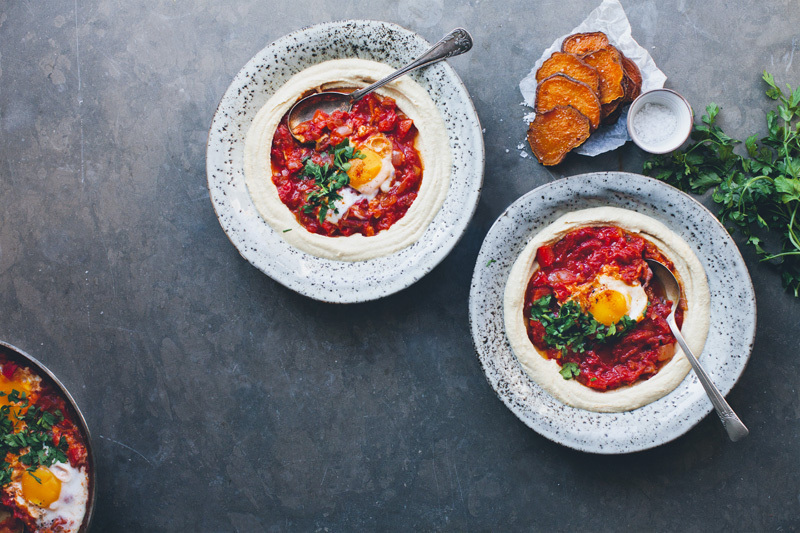 I adore shakshuka, but the idea of serving it over hummus never even crossed my mind! This sounds more than fantastic and now I'm certain I must make this ASAP! Thank you, thank you, thank you! Looks absolutely delicious - sweet potatoes and hummus are my favourites! Gorgeous pictures:)the food scene here is indeed incredible and I especially love that vegetables are used in such an innovative way here.